For centuries, and even today, the Santa Compaña has become one of the most widespread legends of Galicia. Stoking terrors of children and of course walkers and shepherds overnight, also known as the All Souls Procession is torn between myth and reality.Before getting in fatigues and comment on some of the key points that seem to be neuralgic places for their appearance, let's get in position. What is the Santa Compaña? 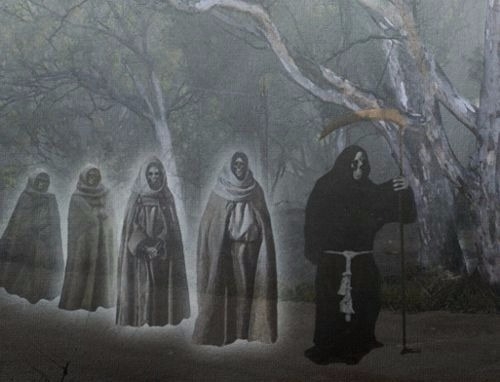 Own course of Asturias and Galicia, the legend has the appearance of a row of ghostly hooded men whose function is none other than visiting or put on notice of a future death. Also known as hostess, Estadea, Compaña or Genti of Muerti, the Holy Company, its origin is rooted in European legends belonging to the Middle Ages. 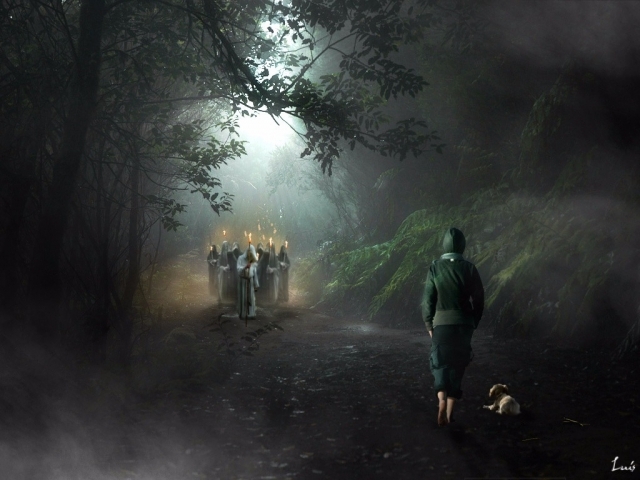 In them the appearance of a group of dead or lost souls dressed in robes browser, on horseback and accompanied by sniffer dogs mentioned. Like the Procession of Souls, his act of presence was synonymous with tragedies, as indicated by several authors throughout the eleventh and twelfth centuries in their writings. Far from being a parade of souls, the Santa Compaña carries a meaning, a message that must be understood by those who, unfortunately, have the "fortune" to cross the procession. Although people who have witnessed their appearance abound, the legend known to all notable for how and why, these being primarily responsible for respect breathe at the thought of coming across the parade spectral characteristics. The Santa Compaña appears headed by a living person, a mortal who in his hands leads from a cross, through a cauldron with water according to witnesses. Next to this, followed by several masked men in a perfect row that is accompanied by songs and prayers. Carrying a candle and a small bell, the Santa Compaña will kick off the march at night, lifting behind a dense fog, wind and of course smell of wax.Surely now you might be wondering, "and the person chosen to lead the procession, Who is this?". According to the legend, in addition to a select few who have witnessed the phenomenon, the mortal who heads the row of souls died a few days later - due to a sudden deterioration in his health - or pierced his cross to the unfortunate witness who he crossed with the Holy Company, being the new "leader" of the Estadea. I say, if you cross with the souls you in some of your journeys along the road at night, escape it is solvable. From making a circle and introduce us to him, to lie down face down on the ground, praying and easiest way ... run.Among the many places where we can crossing with the Santa Compaña in one of the always magical Galicia, the Rias Baixas are coruñesas hub for ourselves face to face with the unknown. For all it is known that Galicia is known for its legends, always halfway between magic and fairy tales; but the procession Animas has earned not only being possibly the greatest passion story - and respect - instills in our country; but also one that more ears has come out of Spain.That said, we find all kinds of stories throughout Galicia, but especially in the area mentioned lines behind where the phenomenon takes on greater importance and prominence. Obviously, the remaining enclaves of Galicia are also sensitive to the appearance of the Estadea, but certainly the Rias Baixas reap the greatest number of sightings of espectros.A all this we must add two key nights that increase the chances of meeting point: San Juan (23 to 24 June) and Todos los Santos (October 31 to November 1).Regulars or not the Camino de Santiago, know the Cruceiro calls; the famous pilgrim crosses all located during the voyage on the trip. This is one of the elements to consider in the legend because, although it should do a circle, pray or corráis as a soul by the devil ... any encounter with the Santa Compaña should terminate in a stone cross. The reason? One of the different meanings of this monument passed to protect the pilgrims who by quirk of fate has put the Animas procession on its way.